The shoulder is a ball and socket joint. 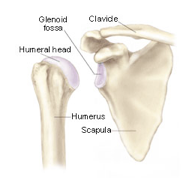 The ball (head of the humerus) sits in the socket (the glenoid fossa). The socket is surrounded by a ring of soft-tissue called the labrum; the labrum functions to deepen the socket and thus stabilize the humeral head in the socket. 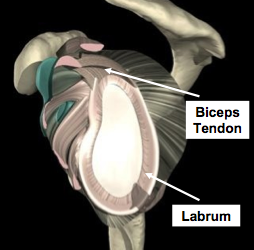 In addition, the long head of the biceps tendon attaches to the superior (top) part of the labrum. 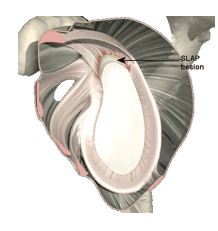 SLAP (Superior Labrum Anterior to Posterior) lesions are tears involving the superior part of the labrum, where the biceps tendon attaches. These lesions may be due to an acute traumatic episode, such as a shoulder dislocation (see Shoulder Instability) or a sudden traction injury to the arm, such as when trying to lift a heavy object or when trying to stop a fall or slide. 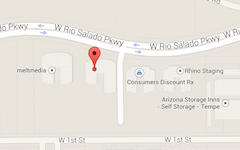 or cuff tears (see Rotator Cuff Tear). Patients with SLAP lesions typically complain of shoulder pain. The pain may be in the front of the shoulder, deep within the shoulder, or in the back of the shoulder. The pain is often worse with overhead arm activities or throwing. Many patients report pain radiating down the front of the arm in line with the biceps tendon and muscle. Frequently, mechanical symptoms such as painful clicking or popping are experienced by patients with SLAP lesions. ion. The lesion is then confirmed by an MRI scan; frequently a contrast dye injection into the shoulder is performed to make the SLAP lesion easier to visualize on the MRI. The treatment of SLAP lesions depends on the nature of the injury and symptoms. In patients experiencing pain, but no mechanical symptoms, a trial of non-operative treatment is often performed initially. This usually includes anti-inflammatory medications, a course of physical therapy, and possibly a cortisone injection. In patients with an acute traumatic injury, patients with mechanical symptoms, such as clicking and popping, or patients who fail a course of non-operative treatment, surgery is often recommended to repair the torn labrum. Dr. Farber performs this procedure using the latest cutting-edge minimally invasive arthroscopic techniques. For a video animation illustrating arthroscopic labral repair click box here.